, author of a history of the Saracens, or rather a chronology of the Mohammedan empire, was born in Egypt, towards the middle of the thirteenth century. 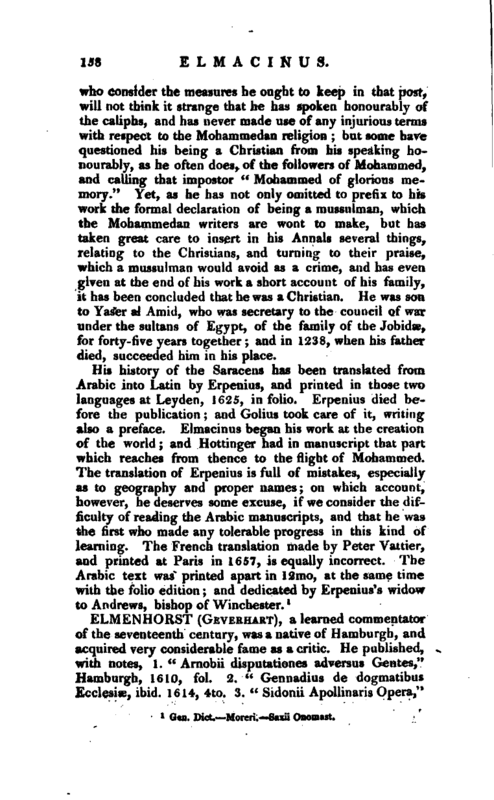 His history comes down from Mohammed to the year of the hegira 512, that is, to A. D. 1148: in which he sets down year by year, in a very concise manner, what concerns the Saracen empire; and intermixes some passages of the eastern Christians, keeping principally to Arabia, Syria, Egypt, and Persia. 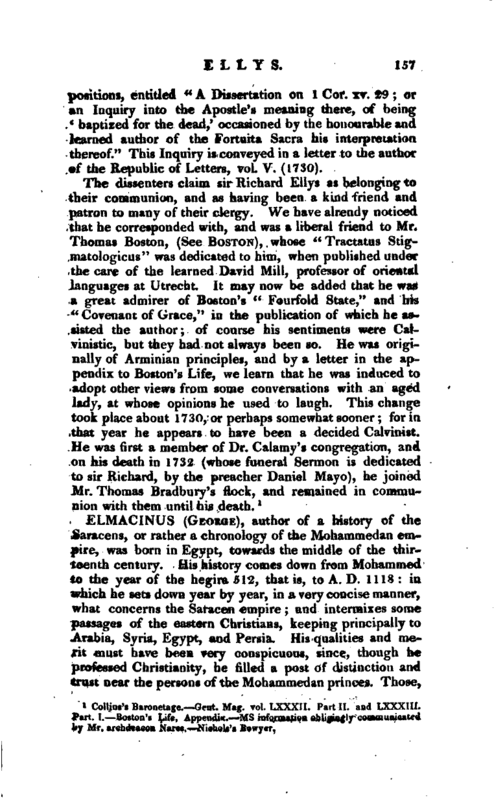 His qualities and n>e­>rit must have been very conspicuous, since, though he professed Christianity, he filled a post of distinction and trust near the persons of the Mohammedan princes^ Those, | who consider the measures he ought to keep in that post, will not think it strange that he has spoken honourably of the caliphs, and has never made use of any injurious terms with respect to the Mohammedan religion; but some have questioned his being a Christian from his speaking honourably, as he often does, of the followers of Mohammed, and culling that impostor “Mohammed of gloriousmemory.” Yet, as he has not only omitted to prefix to his work the formal declaration of being a mussulman, which the Mohammedan writers are wont to make, but has taken great care to insert in his Annal< several things, relating to the Christians, and turning to their praise, which a mussulman would avoid as a crime, and has even given at the end of his work a short account of his family, it has been concluded that he was a Christian. He was son to Yaser al Amid, who was secretary to the council of war under the sultans of Egypt, of the family of the Jobidw, for forty-five years together; and in 1238, when his father died, succeeded him in his place.